Up until now, the worlds we've visited with robotic spacecraft have been composed largely of rock, ice and gas. 16 Psyche is part of the asteroid belt - the sprawling mass of planetary leftovers that orbits the Sun between Mars and Jupiter. This resulted in some objects, like Earth, forming a rocky crust and mantle around an iron-nickel core. The core is the source of our planet's magnetic field, which protects the atmosphere from being stripped away by charged particles from space. 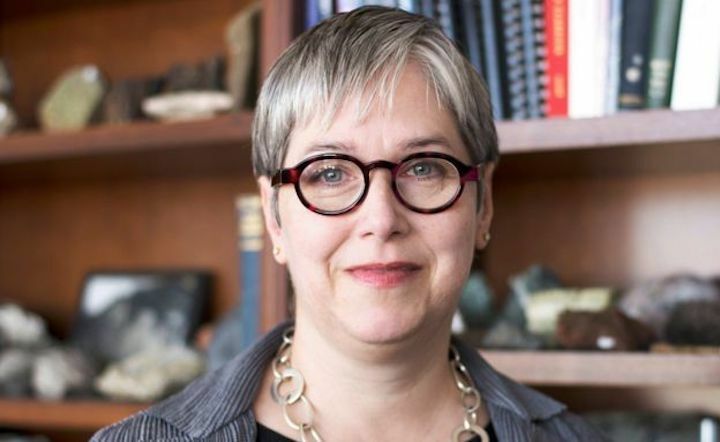 Lindy Elkins-Tanton is principal investigator for Nasa's mission to Psyche. She said the first task for the mission after arriving in 2026 was to test the idea 16 Psyche was indeed a planetary core. "It might be solid metal, or it might be a pile of rubble that's mostly metal," Prof Elkins-Tanton told BBC News. "So there are a bunch of different hypotheses over what it might be and how it might have formed." After that, "we will go on to understand what its composition is", she explained. "Would it be compositionally similar to what we think the Earth's core is, or very different from that?" The mission will seek to understand the asteroid's surface features, or topography. 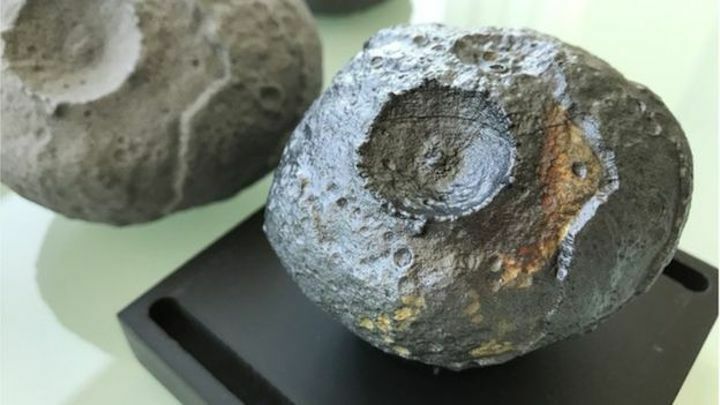 It's not known whether metallic objects like 16 Psyche are covered in a superficial layer of regolith - the dust, soil or bashed-up rock that's found at the surface of the Earth, the Moon, Mars and some asteroids. In addition, says Prof Elkins-Tanton, "we don't know what impacts into metal look like - they could look very different from impacts into rock or ice". Scientists want to understand whether the metal asteroid produced a magnetic field as it cooled. If the asteroid froze from the inside out, similar to the cores of Earth and Mercury, there will be no record of one. 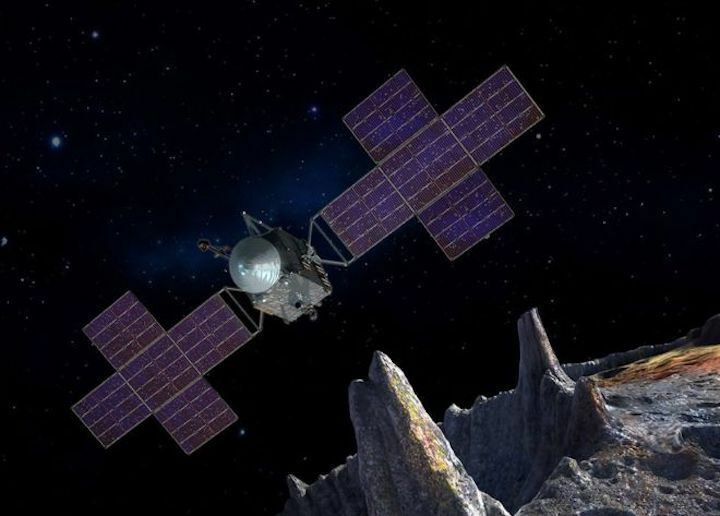 But if Psyche froze from the outside in, as scientists hope, its crust may retain a magnetic memory, allowing the spacecraft to measure and map the asteroid's remnant magnetic field. "One of the things that happens when metal freezes is that it loses about 7% of its volume. So we have a crust that's solid and the inside is continuing to solidify, but it's losing its volume as it solidifies," said Prof Elkins-Tanton, from Arizona State University (ASU) in Tempe. "The crust has to crack and settle to accommodate the loss of volume during freezing." Studies of iron meteorites have shown that a sulphur-rich fluid sometimes forms inside the parent body. "We think that could get squeezed out through the cracks and form a kind of sulphur-iron volcanism on the cooling Psyche," said the mission's principal investigator. She said the team was "super-excited about this", but explained that it was "completely hypothetical". "Our very best and favourite model for Psyche is that it froze from the outside in, recording its [magnetic] field and that it would be covered in the now billions-of-years-old remnants of sulphur volcanoes," she explained. The Psyche spacecraft will also test several important technological innovations. The engine uses inert gases - energised by electric power from the solar arrays - to provide gentle, non-stop thrust. The mission was formally chosen by Nasa in March 2018, along with a separate asteroid mission called Lucy. The Lucy mission will launch in 2021 to explore the Trojans, a group of asteroids that share Jupiter's orbit around the Sun.